Remember the old Cheese Krispies recipe from the 50’s or 60’s? I loved those things. My mom made them every year at Christmas time as part of an appetizer tray and we devoured them, batch after batch. I had a craving for these the other day when I was searching for finger food ideas. I was excited when I found her old recipe on a scrap of paper, written in her beautiful handwriting, but that’s where my excitement stopped. Margarine? I remember vividly the blocks of paper wrapped Parkay margarine that she used in her baking. We don’t touch the stuff. Rice Krispies? A quick glance at the ingredients list on the package convinced me that I either had to abandon this recipe or adapt it. I did a quick online search and BINGO! Here’s a slightly healthier recipe (or one that at least contains fewer additives) that I found by on Food52 and have copied here. Preheat oven to 350 and line cookie sheets with parchment. Scoop small balls of dough (about 1/2 teaspoon) and roll in the palm of your hand. Place on cookie sheet and flatten with fork or spatula. (You can also roll the dough out about 1/2 inch thick and use small cookie cutters.) Sprinkle the tops with smoked paprika and more salt if desired. Remove from cookie sheet and cool on wire rack. Store in an air-tight container, or freeze. 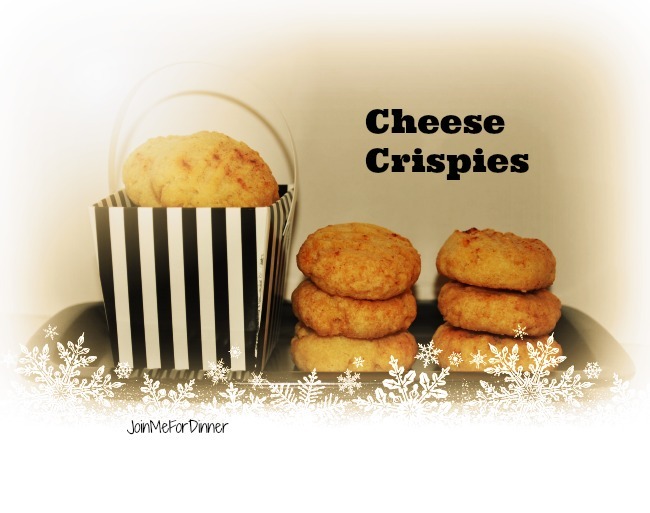 This entry was posted in appetizers, Christmas and tagged appetizer, cheese and Rice Krispie cookies, cheese cookies, cheese crisps with Panko, cheese Krispies, savory appetizers. Bookmark the permalink.